I’m happy to follow up on my previous post about Mudville at the Movies by reporting that The Place Beyond the Pines actually did make it to the Cineplex after its stay in limited release. We saw it this weekend and found it to be complex, detailed, and thought-provoking. his is one of the movies we discussed and argued about on the way home, exploring the themes and messages of a story that deserved analysis. In the end, though, my husband liked it much more than I did and I think that’s because this film is mostly about men’s issues, challenges, and concerns. The excellent cast includes only three women—two mothers and a grandmother. They serve mostly as catalysts that move the plot along and cause the men to act in various ways, but only one of the three, Eva Mendes, has any real presence in the story. This is a movie about fathers and sons, nature vs. nurture, good decisions made for bad reasons and bad decisions with good consequences, honor in the face of corruption, willing growth and forced maturity, good instincts and unfortunate results. To go into plot details would be to give away the story and I think it’s better to watch the unknown being revealed than the known being laid out in front of you. Suffice it to say that The Place Beyond the Pines is engrossing from start to finish with a few unforeseen zigs and zags along the way. Unlike this weekend’s other big release, there’s plenty of story with almost no special effects. Ryan Gosling and Bradley Cooper give excellent performances, although Gosling’s role has too many echoes of Drive. Only here he’s on a bike instead of in a car. The male reviewers, like @NPR’s Mark Jenkins have an easier time with the “guy stuff” but still noted problems, particularly Emory Cohen’s miscasting and overacting. Yet, even if the movie doesn’t hold together tightly all the way through, or throws in a coincidence that’s tough to swallow, it’s still well worth seeing — and discussing. 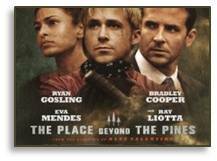 To date, The Place Beyond the Pines has an 80% Fresh rating on the Rotten Tomatoes Tomatometer. It has grossed $11,447,790 on a $15M production budget after only three weeks, two of which were in limited distribution. That’s not bad for a movie that actually makes you think. The theater was not packed on Saturday night, though, so I’m not sure how much longer it will be around. Catch it while you can. This entry was posted in Entertainment, Movies and tagged Anne Hornaday, Bradley Cooper, Eva Mendes, Mark Jenkins, NPR, Rotten Tomatoes, Ryan Gosling, The Place Beyond the Pines, Tomatometer, Washington Post by A Kaplan. Bookmark the permalink.